Recently I was given the opportunity to try some overlays by Sleeklens on my landscape imagery. I was drawn to the Light Leaks and Light Rays overlays for their effectiveness in regards to enhancing the sun for a “natural” creative look. When the right image is chosen to apply one of these overlays the result can be pleasing and not over-the-top in terms of it’s creative effect. 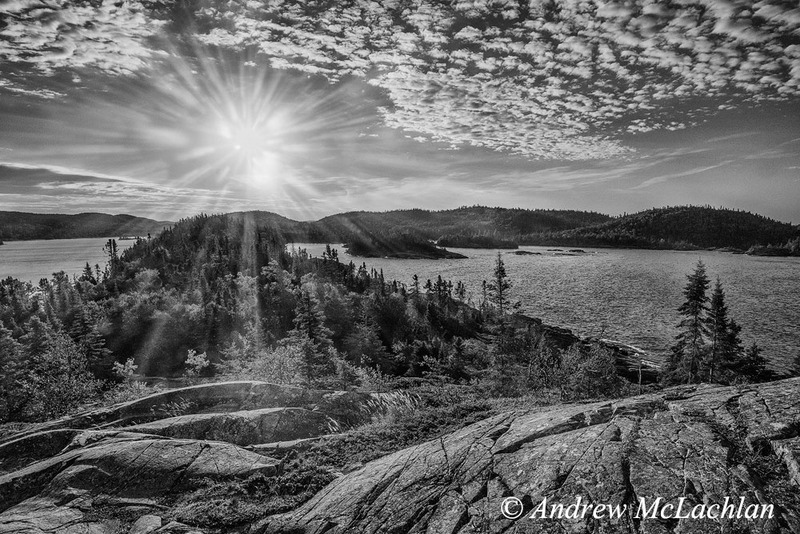 In the fisheye scene above of Hattie Cove on Lake Superior in Ontario’s Pukaskwa National Park I composed the early morning scene to catch a sunburst effect with the fisheye lens. By applying a Light Rays overlay I was able to give the sunburst a more pronounced and dramatic appearance within the scene. Converting the image to black & white was not my initial intention but I felt it brought the image together for a natural look. 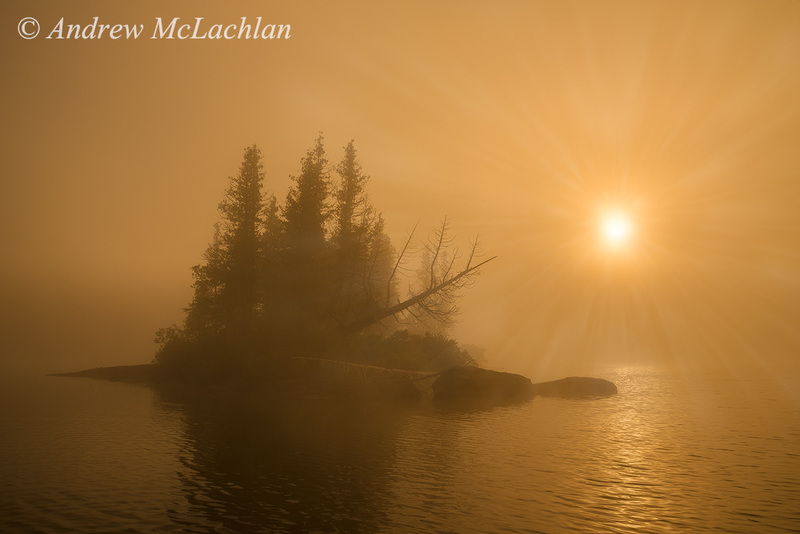 In the below photograph of a misty morning on Horseshoe Lake near Parry Sound, Ontario I chose to apply the same Light Rays overlay that was used in the Hattie Cove image above. Once the overlay is brought into Photoshop I can easily maneuver the rays around using the Move Tool or the Transform Tool. Since the overlay is on its own layer the Opacity of that layer can be adjusted to taste easily as well. Here I chose to reduce the opacity significantly so that the rays of light were just becoming visible through the misty conditions of the morning. 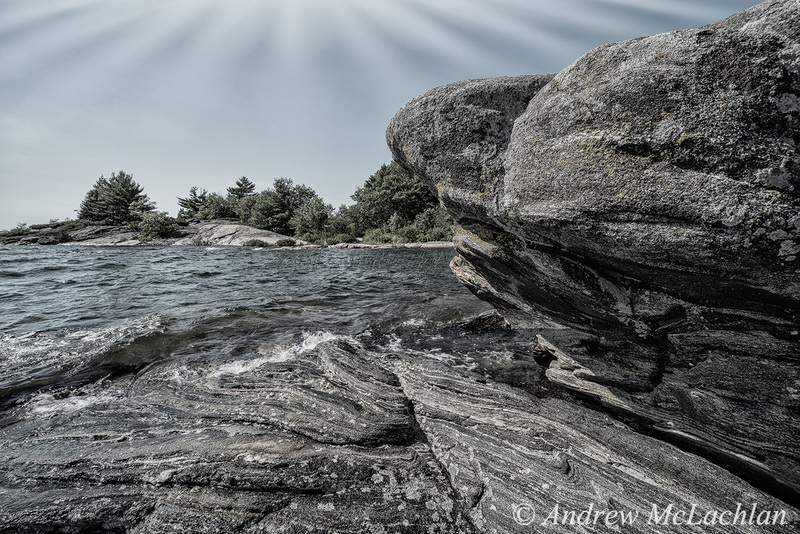 Below is a photo created along the Georgian Bay Rugged Hiking Trail in the town of Parry Sound, Ontario with a Light Leaks overlay applied. This image would express the most creative use I applied, but I do like the added interest it gives to this mid-day scene. To created the desaturated look to this image I originally was creating a B&W conversion in Nik’s Silver Effects 2 but later decided to reduce the opacity of the Silver Effects to bring back a touch of colour to the image. While these Light Rays and Light Leaks overlays may not be everybody’s cup of tea, they do work for me when applied to the right situation. I often create artistic renderings of many of my landscape and wildlife imagery and the Sleeklens overlays now give me another option in my toolkit to utilize along the creative pathway. If you also like to explore the artistic / creative rendering side of your imagery, then you may also find the Sleeklens Photoshop Overlays to be a useful tool and rewarding option too.